Hey everyone! The stamper GA is going to be ending tonight! At 10:00 PM EST actually. 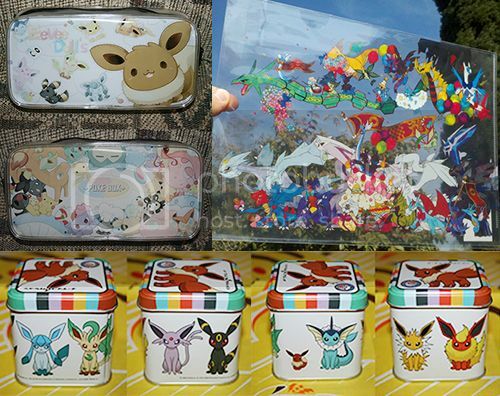 A lot of stampers are at their starting bids and a lot of popular pokemon are still going for pretty low! My co-host killmeneko has also asked me to inform you that she has a few more lots of stampers coming her way, (about 30-50 in just one lot!) She wants to offer these at discounted rates to all GA participants! Which is super nice of her :3 So! Feel free to bid along with us in the GA and take advantage of some sweet discounts later! Go here for the auction page! DX Tomy Ga- payments due! Please leave a comment in this entry to say that you have paid and let me know which country you are in or your area code in youre in the US. remember to leave youre username in the memo when you pay so it can all be double checked by my co-host and we can keep ontop of things, also include which tomys you won. This auction is shipping from the Philippines, what does this mean for you? 2. That means this GA runs the risk of extending over the 35 day comm shipping limit. Other than that everything else arrived "in tact" Again I'm truly sorry to those who's Pokemon I could not replace :C I will set up payment for shipping from me to you after work. First I want to start by thanking everyone in the community for helping get so far so quickly. I already have 188 different Hoenn kids including 2 Shinies and 17 Clears. I feel like that is a huge accomplishment in such little time. I went from having none to this much in just a few months. Thank you all for being so helpful! Anyway, a preview into this update! Anyways.. to the point of this post. SHOW US YOUR RAINBOWS :U small rainbows. BIG rainbows. Pokedoll rainbows. Figure rainbows. WHATEVS. Any kind of rainbow :D Show us all your colorful collections! The seller has replied to Noppin and has added a full list of Zukan figues. I have gone through the list and he says that Charizard, Charmeleon and Charmander are all present, meaning the full Charizard line is in the lot. He has also confirmed that both Aracanine lines are included. They don't seem to be willing to provide another photo, but the seller says they are in good condition, Bid at your own risk, ofc! A countdown timer has also been added. Bidding ends on June 25, 5 PM EST. Make sure to get your bids in before this! Lots of figures are still at cheap prices, and some very rare gen 1 Zukan are still anyone's game. A reminder may not be posted after this. Just a quick reminder, these offers end tonight! 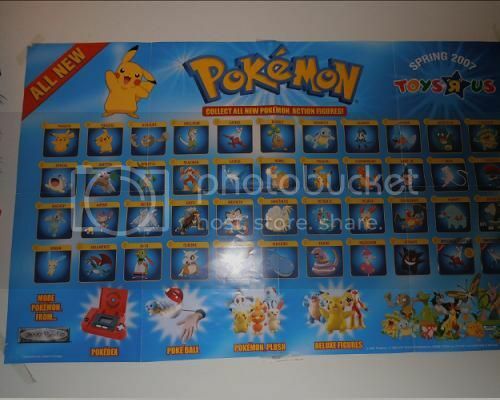 So while I was Pokemon-hunting at garage sales yesterday, I came across a Toys R Us checklist poster for Jakks figures, from really early 2007 I believe? Obviously I bought it, and once I got a better look at it there were a lot of the original Jakks figures on the checklist, but there were also a few I'd never even heard or seen about on the community. Help me out? I've been in this comunity by a while, but I didn't come in so much. Well, come back to the important. 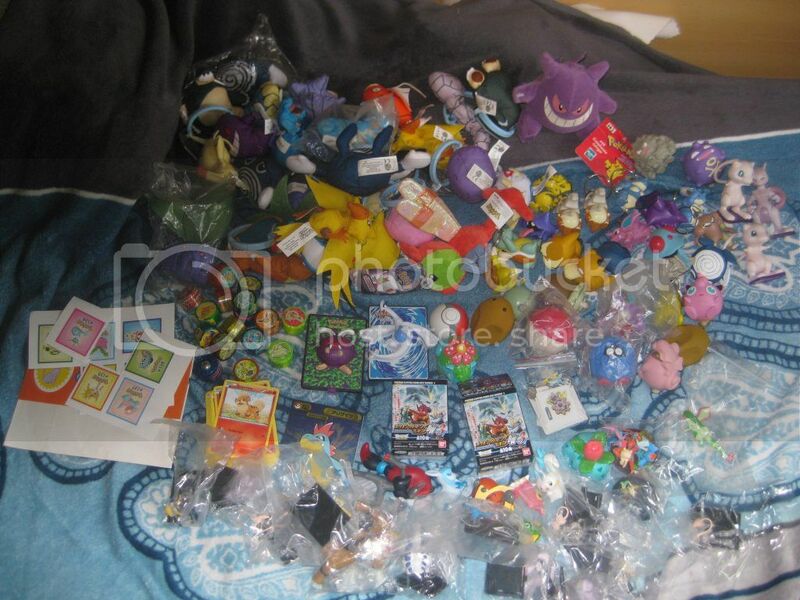 I'm looking for the originals TOMY : MAGMAR, VOLTORB, ELECTRODE, ARCANINE, ZUBAT, GOLBAT, PINSIR, MACHOKE. Hope you will give me a good price for each/all of them, thanks!!!!!!!!!!!!! My tiny "Tiny Turtle" collection! Hello Community! I finally decided to do my intro/collection/want post! My name is Jose, I'm from Texas, and I've been a member of this community since April, I believe. Well, whenever pkmncollectors was on the LJ front page. I've been a fan since the beginning! Actually, I remember my older sister getting this VHS preview of Pokemon in the mail, but I never watched it until it actually premiered, haha. Squirtle has always been my number 1! As a kid, I loved turtles (especially TMNT), and blue was always my favorite color, so the little guy seemed like he was just meant for me, haha. So now, I bring you to my collection, which was very small at first, but thanks to this community, has grown quite a bit! hello! haven't posted for a while~ been so busy! I'm going to a convention next weekend, and then my wedding is 14 days away @w@ so I've mostly been lurking for marills on here! I was searching Marill stuff and came across this. 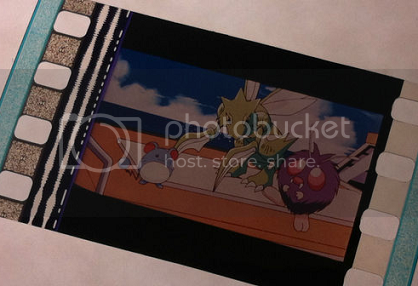 it says it's an "Authentic 35MM Film" from the pokemon movie. Do you think it is legit?? I just find it kinda random! but it would be kinda cool if it was! not much else for now... I am a bit frazzled as I have mentioned I'm planning for con/wedding! Payments 1 are due for Nasija Lot 3! That's right! We won the GA, and there are even small discounts! PLEASE READ FIRST BEFORE YOU PAY! - Payments that you need to pay are in the BLUE column! - Please EDIT the spreadsheet after you have paid and add a yes that you have paid AND where you live, so it is easier for me to calculate the shipping form me to you once the lot arrives to me. - Once you also pay, please LEAVE A COMMENT here in this post that you have paid! - Please pay me WITHIN 48 HOURS from now, NO excuses!! Negative feedback will be left if you do not pay me within that time!!! Read it? Now you can go for the spreadsheet! I've been viewing this page a lot, and I finally decided to make an account here. I'm here to make new friends and add to my collection. My favorite Pokemon is Dwebble, and I would like to start collecting them. Hi all! I just want to take a moment to advertise my sales before I go out of town in a couple of weeks. :D I will close my sales post on June 30 and mail out any last minute purchases the following week so if you want anything, be sure to buy anything before then! Looking for the first 151 Tomy Pokemon figures! The set came from Y!J / Noppin, of course all the plushies are new with tags. Only Ferroseed is still available ! So I wanted to put up a really quick want. Get it...wanted...want? Oh never mind. GA update and Pokebox charms? 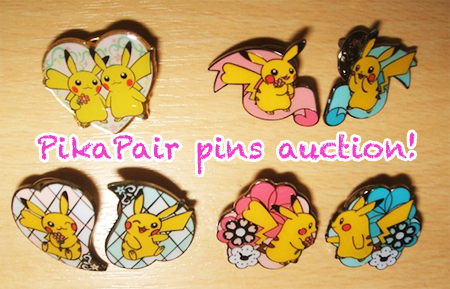 Now, I have 6 of 8 of the poke-box charms (eeveelutions) and think I may auction them off. - Feedback will be left once package reaches you and you confirm its delivery! Please also leave me feedback once it arrives. - I am not responsible for items lost in the mail. If you are concerned please pay for insurance/tracking. - I will try to send items within a 2 -13 business days. That does not include weekends! I bought my first zukan line from eBay, a Tepig line, and look what I got, a bootie!, it's horrible and the seller only refunded half of the price. If you can't see clearly, Chaobu has a black spot under it's mouth and Pokabu is DERPY, and it's NOT a fun and cute derpy. I'm so mad. Is there a list of trustable sellers, becase I saw a list of plushie bootleg sellers but not zukan figures. I wanna start collecting zukan too. Question: How do you make your images smaller? I can't find a tutotial. 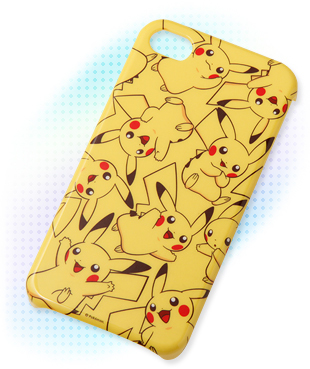 Who likes PikaPair items? I do! Everything from my sales has been shipped! Except for things that are on hold/unpaid, of course. Click the pic or this link! I need some help today with a price issue. I saw this goodie on eBay but don't know if it's worth getting. It is rather pricey but don't now how much these actually go. I really want this for a friend, and if it's possible I want 120 sleeves (2 * 60 for 2 decks).